It was fun to get my camera out this afternoon. 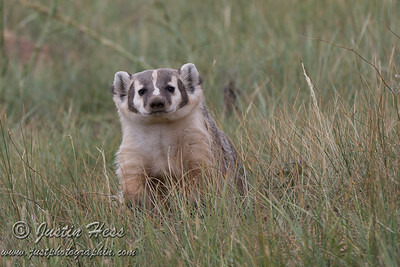 Even though I have taken pictures of a badger before, these ones are by far my best ones yet. My neighbor and I got closer than I have gone by myself. We were still far enough away that a 400mm focal length was not enough! I took two cameras out, one with film and the other one my DSLR. Another reason why I felt somewhat okay getting closer to the badger was seeing how much confidence the deer fawn had. It walked right up to the badger with out giving any thought to danger. The encounter was more entertaining than tragic. Having witnessed the deer fawn approach with confidence gave me more confidence. Of course, I respect any wild animal’s space and realize that it is my responsibility to set limits and then not cross them. Knowing limits comes from observing the animals and then responding accordingly. It is never a good idea to cross the boundaries and end up with a conflict – injuries to persons or animals. 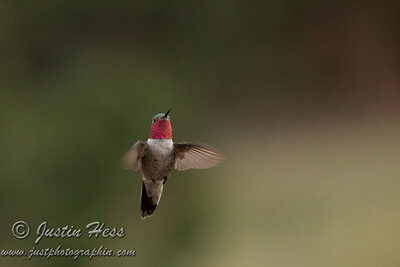 It is getting closer to migration time for the hummingbirds. They are still active, but will probably start heading south in September. I figured that since they were particularly active at our feeder tonight, I should try some photos of them. I ended up getting a few decent shots. Next time, I will change some of the auto-focus settings in an attempt to get even more photos.